Today we’re helping you get in the holiday spirit by sharing some of our favorite free sewing projects for the holidays. Keep checking back each Friday from now until the end of the year for more holiday project inspiration, from decorations to deck the halls to quick gifts for loved ones and more. 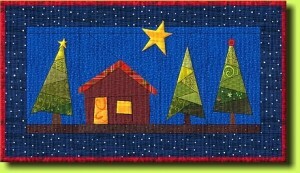 This week we’re sharing some of our favorite holiday themed quilting projects! To see last week’s home dec post, click over to Deck the Halls for the Holidays. Make some pretty pieced placemats and coasters to bring some holiday cheer to your table. 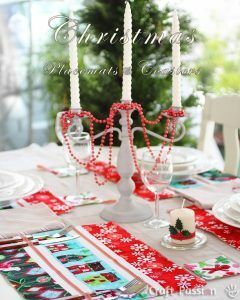 Get the Christmas Placemats and Coasters DIY from CraftPassion.com. Melissa from the Polkadot Chair created this playfull quilted runner for Moda Bake Shop. She also includes a terrific tiny tree skirt tutorial, perfect for a tabletop tree. 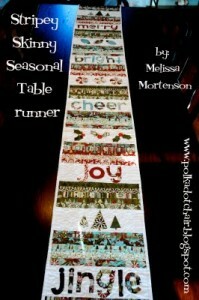 Get Melissa’s Stripey Skinny Seasonal Table Runner and Stripey Tiny Tree Skirt Tutorial. Make a winter scene with textile artist Regina Grewe’s free paper piecing pattern for the little cabin and trees. Make a nighttime winter scene, or see Regina’s version of the trees in a white winter wonderland setting. Click here to get the Winter Forest Free Block Patterns. Make Angela Pingel’s Gift Box quilts as a gift, or keep it all to yourself for curling up on a cold winter night. 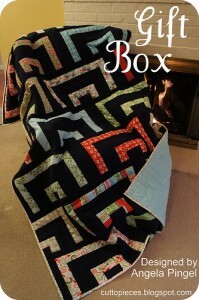 Get the instructions for making the Gift Box Quilt. Kati shares instructions for how to make a lovely paper pieced Christmas tree block at her blog, From The Blue Chair. 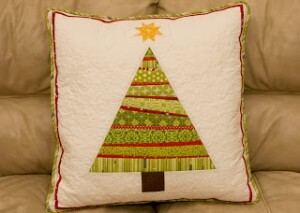 Click on over to get Kati’s tutorial for the Tree Pillow. 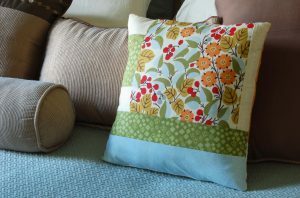 And we think our Geometric Squares pillow would look lovely in holiday fabrics! Frame out a big holiday print or use your favorite festive colors to celebrate with this pillow. Link to our WeAllSew Geometric Squares pillow project. Next Next post: Paint That Plate!